Big Freight was recognized with the Truckload Carriers Association’s National Fleet Safety Award in 2016, for being North America’s safest fleet (under 25 million miles), and it received the 2017 Canadian Shippers’ Choice Award. 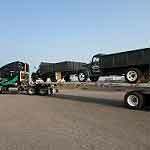 The company is now preparing for growth opportunities, as part of the Daseke family of flatbed haulers, which it joined in 2017. Big Freight currently operates a fleet of 150 trucks and 350 trailers, serving all of North America; it continues to invest in new trucks and trailers, including the recent addition of specialized vans for the power-sports industry. In addition to its own flatbed-freight hauling services, Big Freight offers logistics management, fleet maintenance, (through its FleetPro facility in Steinbach, Manitoba), and warehousing and distribution services to its customers. Its facilities include a 300,000-square-foot storage warehouse in Winnipeg. Big Freight has developed specialty niches such as handling distribution for all major power-sports-equipment manufacturers. Big Freight was founded by Gary’s father (Red) and his grandfather in 1948. After selling the family farm in Steinbach, Manitoba, the Colemans purchased a four-truck operation called South East Transfer. Big Freight adopted its present name in 1996. Rod Miron, a 29-year veteran of the trucking industry who recently joined Big Freight as operations manager, says the company has been able to grow by developing new lines of business and maintaining a customer-service focus. “We don’t say no,” he says. “We look for value-added solutions.” The ability to come up with those solutions will be enhanced, he added, as Big Freight works with other companies in the Daseke family, exchanging ideas about how to further the tradition of being customer-service driven. To keep its employees and trucks operating efficiently and safely, and to keep customers satisfied with top-quality service, Big Freight implemented a Continuous Improvement program in 2013, with multiple employees winning belts to signify completion of steps in their training. Coleman says the emphasis on continuous improvement has its rewards: in 2017, driver miles were up while accidents and claims were down.